It’s no secret that Cinco de Mayo is my favorite holiday for food. It reminds me of bright and festive colors with the sounds of Mariachi’s playing in the background. And the food . . . Oh, how it makes my mouth water! 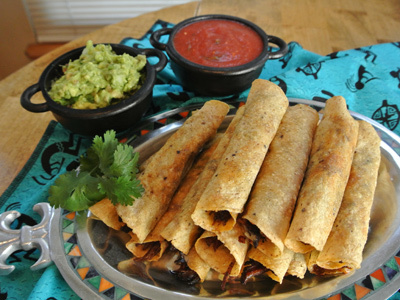 This year we’re having Taquitos which are fun to dip in your favorite guacamole or salsa. I’ve found that the key to making perfect taquitos is picking the right corn tortilla. Some corn tortillas are too soft and will fall apart when you try to roll them. But if you find a good thin tortilla that has a coarser texture they will hold together when rolled, and easier to pin together with a toothpick. 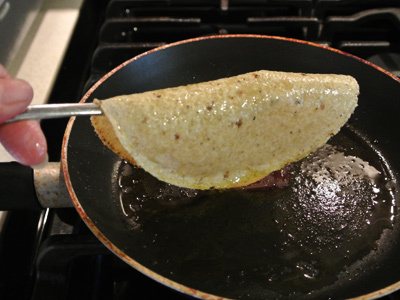 Another key is to pan fry the tortillas for a few seconds on each side. The small amount of oil left on the tortillas enables them to crisp up nicely in the oven so that you don’t have to fry them. 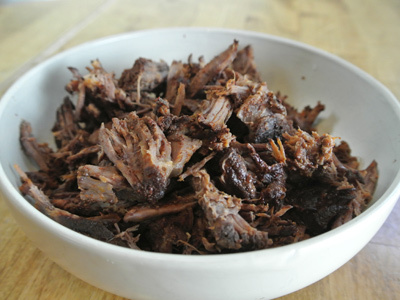 I cheated and used Frontera’s Barbacoa slow cook sauce to add the wonderful flavors to my roast. 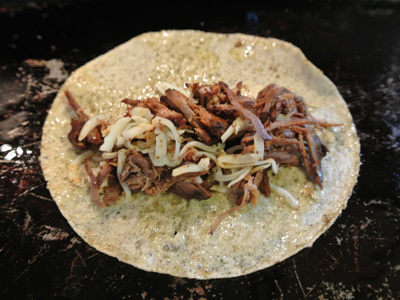 I then shredded the beef along with some grated Oaxaca cheese to make a tasty filling. They turned out so good, I plan on making another batch soon, maybe trying chicken next. Happy Cinco de Mayo all! 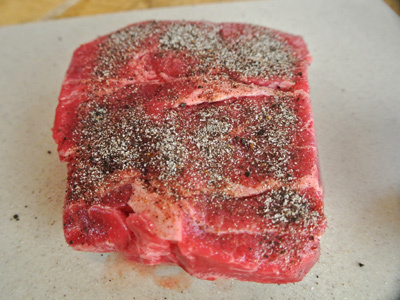 Chuck roast is always a good choice. I only wanted 1 pound of beef so I picked up a small 2 pound roast and cut it in two. 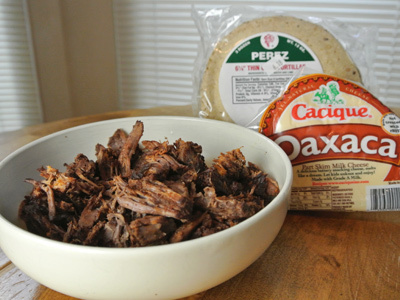 I’m a fan of the Frontera brand sauces, this Barbacoa slow cook sauce has excellent flavors. I made a dry rub by combining some salt, ground Ancho chiles, garlic powder, onion powder and espresso powder together. Sprinkle over both sides of your roast. And drizzle some olive oil. Heat a dutch oven and sear the roast on both sides. 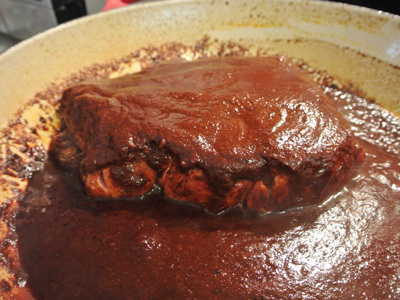 Then pour the packet of Frontera Barbacoa sauce over the roast, plus 1 1/2 cups of water. Now here’s my confession . . . I forgot the water and almost burned the sauce. Luckily for me it caramelized into the roast and tasted really good. I probably wouldn’t tempt fate again, next time I’ll add the water! This should cook low and slow for 2 – 2 1/2 hours. I cooked mine on top of the stove but you could cook it in the oven at 300 degrees and get the same results. My sauce was a bit dark since I forgot the water, but the flavor was excellent in spite of my forgetful nature. Shred the beef with 2 forks and place in a smaller bowl. Along with the barbacoa filling, I’m going to add a cup of grated Oaxaca cheese which melts easily and tastes so good. I found these Perez corn tortillas that are made locally and are a bit larger at 6 1/4 inches in diameter. They are very thin and have a much coarser texture than the “Mission” brand. I heated some olive oil in a small skillet and let the tortillas sit for just 2 – 3 seconds on each side. This was just long enough to make them pliable and absorb a little bit of oil. DO NOT pat the tortillas down with a paper towel. The oil will give your taquitos that crisp texture that makes them so good. Add a drizzle of oil to the pan before frying each tortilla, then set the tortillas aside on a baking sheet to assemble. 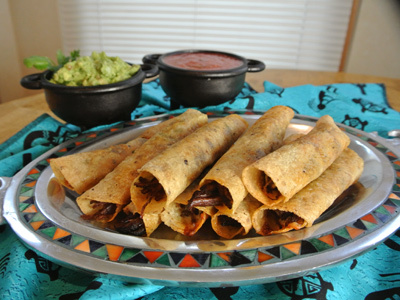 Fill each tortilla with approximately 2 heaping tablespoons of shredded beef and cheese. Roll the tortilla around the filling fairly tight and pin together with a toothpick. 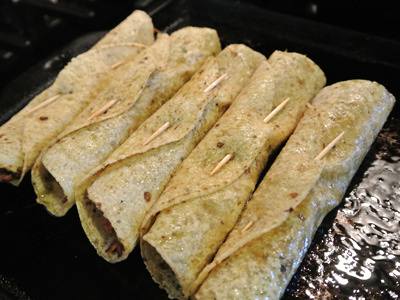 When you have finished, lay the taquitos seam side down and place in a preheated 350 degree oven for 15 – 20 minutes. After about 10 minutes, flip the taquitos over to crisp the other side. They come out of the oven slightly browned and crispy. Remove the toothpicks before serving. 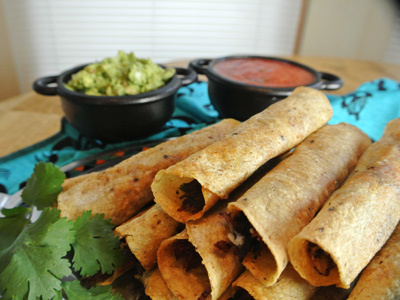 Guacamole and Chile de Arbol Salsa are the perfect dippers for these taquitos. 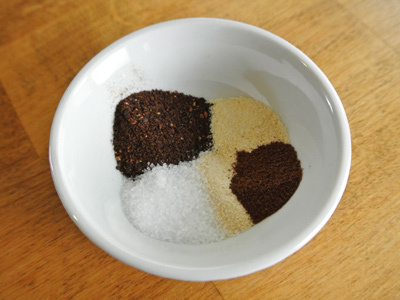 Combine salt and spices in a small bowl. 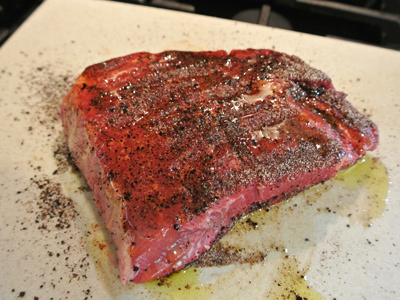 Sprinkle over both sides of chuck roast and drizzle with olive oil. Sear roast in a preheated dutch oven. 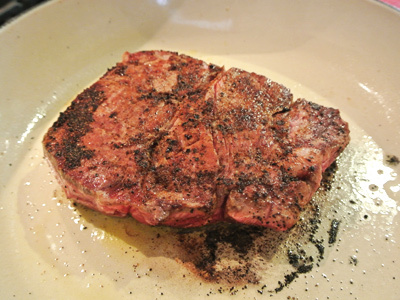 Turn to sear both sides. 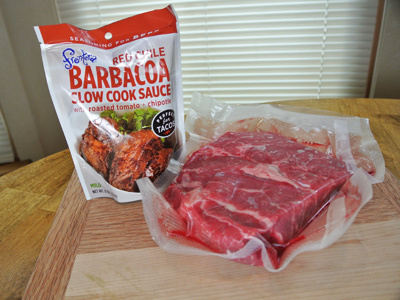 Pour barbacoa sauce over roast along with water, cover with a lid and turn the heat down to low. Cook slow for 2 – 2 1/2 hours, checking every 30 minutes or so. The roast will easily pull apart when done. Remove roast and pull apart with 2 forks, spoon any remaining sauce over the pulled meat, set aside. Heat a small skillet with a drizzle of olive oil. Pan fry the tortillas one at a time adding a drizzle of olive oil before adding each one. Heat for just a few seconds on each side, just enough to make them pliable, and to absorb some of the oil. Set aside but do not pat dry the tortillas. Preheat oven to 350 degrees. Combine grated cheese with the cooled roast to make the filling. Lay a tortilla flat and add approximately 2 heaping tablespoons of filling to the center of the tortilla, roll the tortilla around the filling and secure with a toothpick at the bottom. 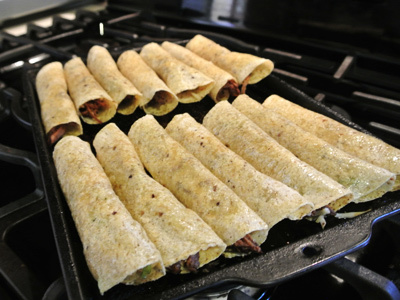 As you assemble the taquitos, lay them seam side down on a baking sheet. 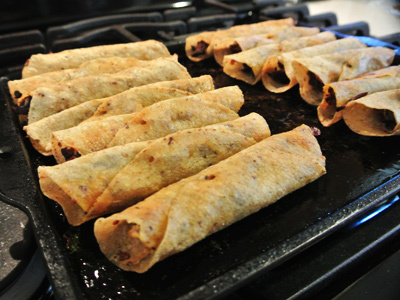 When all taquitos have been assembled and rolled, place in preheated oven for 10 minutes. Turn the taquitos over to crisp the other side for an additional 5 – 10 minutes. Taquitos should be browned and crisp when done. Remove toothpicks before serving. Serve hot with guacamole and salsa.